Digital News Roundup: What's New? What's Next? One of our favorite pastimes around here is keeping an ear our for trends happening in the digital and social space. Inspired by our recent learnings at The Mobile Marketing conference and always eager to know what else is out there, let's use this space to browse and share together throughout the year. 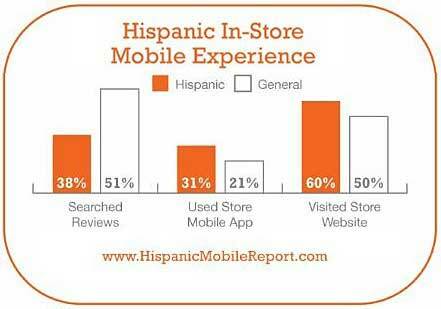 In the mobile space, Marketing Profs shared some findings from Sensis and White Horse (pictured left) on Hispanic use of mobile for "showrooming"
In fact, Mobile continues to grow with many audiences leading to innovative uses worldwide. This Springwise post highlights "Korea’s Waffle platform, which enables businesses to offer free internet access to customers who like them on Facebook." as well as a WiFi portal that rewards responsible dog walkers. It may sound silly, but it is further evidence of a trend away from "the web" being a destination towards the internet being always all around us. This piece in Forbes claimed "We will never have Web 3.0, because the Web’s dead." warning that web giants will "will have all the money in the world to try and adapt to the shift to mobile but history suggests they won’t be able to successfully do it." Weather they will be successful is still up in the air, but they certainly seem to be making a go of it. Chief Facebook Operating Officer Sheryl Sandberg recently stated “Mobile is a key area of growth for Facebook,” and new mobile search ad improvements recently announced for Google. Facebook is deeply embedded in other trends right now as well. Most recently, a trend towards bridging online and offline for retailers. One Brazilian retailer is displaying "likes" in real-time and other stores are allowing users to give away free gift cards to friends in exchange for Facebook attention. Additionally, the impact of their recent decision to purchase Instagram has yet to be fully understood, but chances are it will pay off. Meanwhile we would be remiss not to mention that the other social network, LinkedIn, is having a bit of a moment right now. The site "rose to the highest price since its market debut after reporting first-quarter sales and profit that beat analysts' estimates amid a jump in membership" and purchased SlideShare as well. Given this news, it doesn't appear that any of our current web giants are going to be out for the count anytime soon, but we'll be curious to see how these trends play out. Have you noticed any digital marketing trends lately, share with us in the comments!